We will be! Back today, Wednesday, for probably the last time this season and back with the pepper roaster on Saturday, let the roasting begin! The flower department is down to the fall line-up. It is all about Celosia in all it’s intense colors and shapes. The supporting cast this week are Limelight hydrangeas still really big and beautiful from all the water they have received. A few late season Zinnias and of course Beautiful Bouquets. Finally enough sweet colored fruit to begin roasting. The first of the Red Bells but a good volume of Red, Yellow and Orange sweet Corno di Toro’s. Rounding out the sweet peppers are Purple Bells and Cubanelles. In hot peppers a good amount of Anaheim and Poblanos for roasting and other uses. 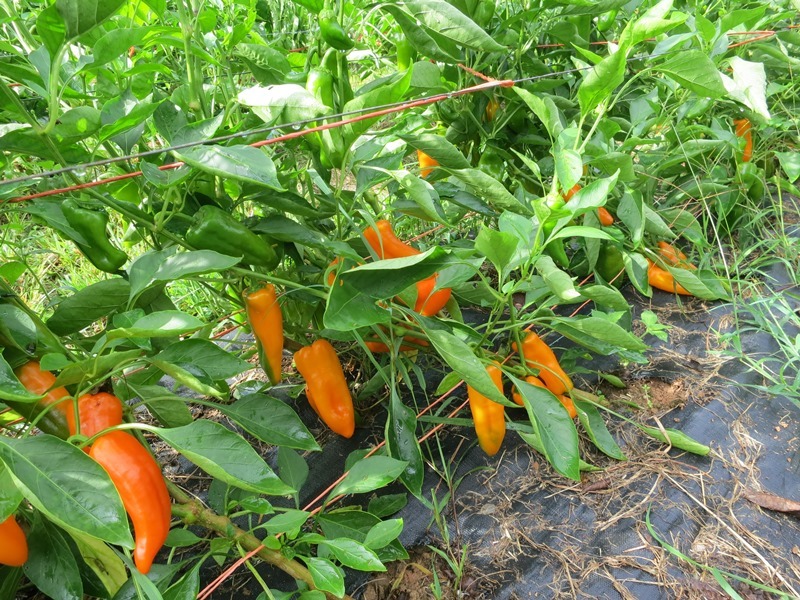 In the rest of the hots we have Passillas, Jalapenos, Serranos, the first of the Picante Pimentos and Cayennes. In not or rarely hots the first of the Aji Dulce (the habanero without the heat) and the appetizer Japanese Shishitos and Spanish Padrons. It is the beginning of the transition to cool season crops with a few Radishes and a new Asian green Yukina Savoy a very mild mustardy flavor with the texture of spinach. Sweet Red Onions and the last of the Long Red of Tropea Italian cooking onion. Still nice Basil. A few more Italian heirloom Eggplant but the plants are taking a beating in this rainy weather. It is a Fig year for sure, still producing. Look forward to seeing you refreshed after your two weeks away! Happy belated old man! Sorry to have missed the cover crop workshop, we wanted to be there. Hard for me to sit in one place for very long at this point! Those peppers are stunning, what lucky customers you have. Hope you and Betsy are doing well, and so sorry to hear the news about Gary. We were unaware he was battling cancer, he will be missed; he was always such a sweetheart. Thanks, just another day. The workshop went well, not sure you would have learned much new. Gary had recurring bouts with abdominal things, liver etc. He is better off now.